Make the cake: Preheat the oven to 375°F. Generously grease and flour the inside of metal bowl. Set aside. In a large bowl, whisk together the flour, baking powder, baking soda, salt, cinnamon, and nutmeg. In the bowl of a stand mixer fitted with the paddle attachment, mix the brown sugar and oil. Add the eggs, one at a time. Add the flour mixture in 3 batches, mixing until just combined. Gently fold in the carrots and pecans. Pour the batter into the pan and tap sides to get rid of air bubbles. Bake until top is browned and a wooden skewer inserted in the center of the cake emerges clean, about 1 hour. Let cake cool completely in the bowl, then turn out onto a cooling rack. Make the frosting: In the bowl of a stand mixer fitted with the whisk attachment, combine butter and coconut milk, beat until creamy. Add the powdered sugar one cup at a time allowing the sugar and coconut-butter mixture to fully combine with each addition. When all the sugar is incorporated, turn the speed of the mixer up to medium-high and continue to beat until the mixture is light and fluffy. The frosting should be stiff so that it holds its shape when being piped onto the cake. Assemble the cake: Using a serrated knife, cut the excess cake off the base. Flip the cake and position it on the surface you wish to serve. 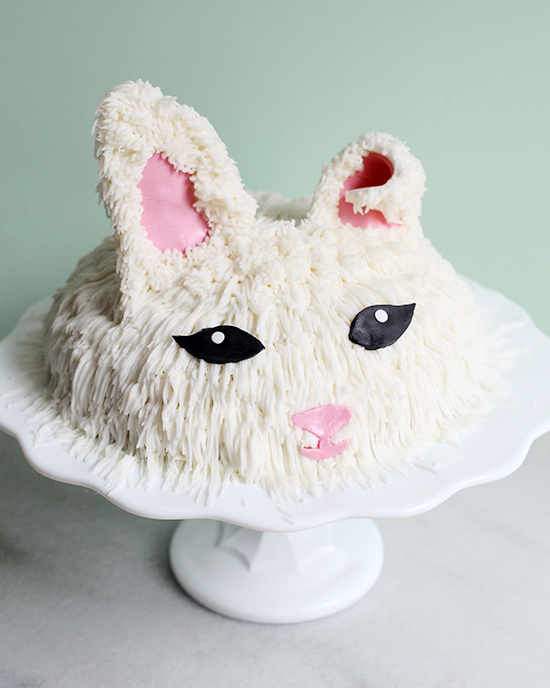 Frost the entire cake with a thin layer of frosting, this will act as the base for the “fur” to stick to. Place the cake in the fridge for 15 minutes so the frosting can set. Meanwhile, transfer remaining frosting into a piping bag fit with a multi-opening piping tip. Starting from the bottom of the cake, pipe the frosting using quick motions resulting in 1/2 inch long sections of “fur” all the way around the base. Continue to pipe the frosting in layers up the cake until you reach the top of the dome. 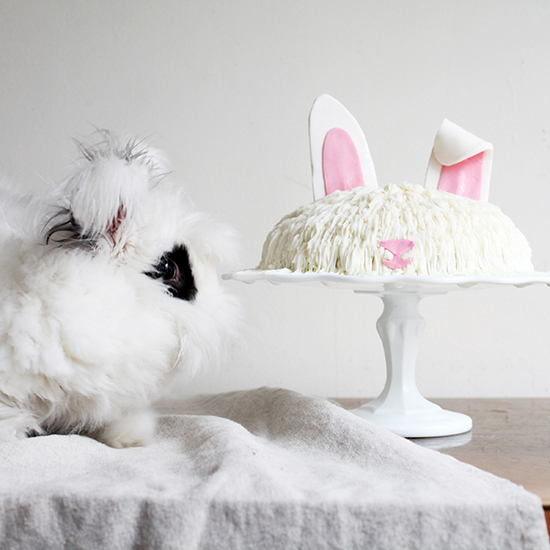 To make the ears and the nose: Roll out the white fondant until ¼-inch thin then cut into 2 long ear shapes. 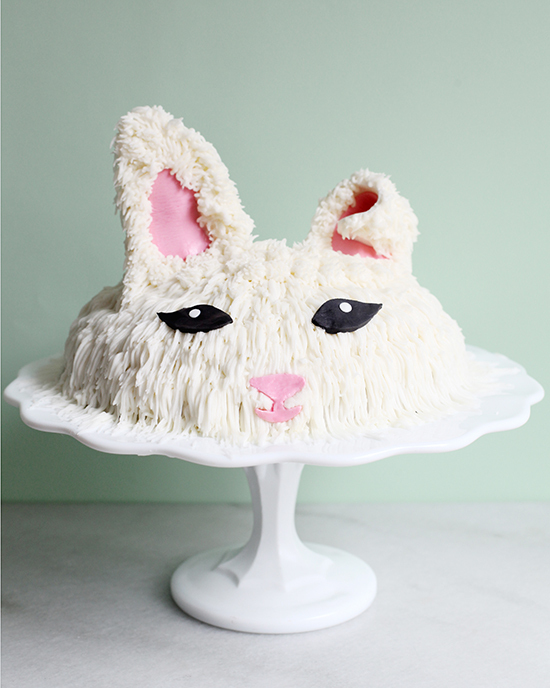 Mix food coloring into a separate pieces of fondant, roll the ¼-inch thick and cut into pink inner ears. Use water to glue the two pieces together. Cut a nose shape out of remaining pink fondant. Make black eyes to finish. Press the finished pieces into the cake to decorate.